I’m sick – not terminal disease sick, but just a common flu; still bad enough to have made my day miserable and lethargic. Hence this is as much a study as it is a pick-me-up just for today. Proverbs 17 continues the series of miscellaneous proverbs, without any clear theme or much continuity between the verses. The book of Proverbs, being one of the books of Wisdom and Psalms, clearly some verses related to wisdom and understanding even in this chapter, while the rest of the miscellaneous verses from the surrounding chapters revolve around any topic under the sun that will be able to aid us in our growth and development. If I’m not sick today I’d probably zone in on the aspect of spiritual illness in relation to this verse, but since I’m sick, and miserable, I’m not going to skip the attempt to apply this verse to physical ailments. Grief, anxiety, anger, fretfulness, fear, depression, indifference – have you felt any of these today? Have you felt any of these emotions in the past week? Or should I ask, was there a day that passed where you haven’t felt any of these emotions at all? You don’t have to be physically ill to be spiritually ill. And emotions and attitudes are very crucial to one’s spiritual health. They are most certainly important to one’s mental health as well, and I’d like to argue that they are crucial to one’s physical health too – though I’m honestly very limited in the medical aspect. Much of the Bible teaches against negative emotions – often, they lead us to sin. A failure to control our emotions may lead us to do or say things we regret – hence we are taught the virtue of self-control [Galatians 5:23]. We’re taught to be slow to speak and slow to become angry [James 1:19|Article]. We’re taught to leave our worries to God [Matthew 6:27|Article]. And there’s one main opposite to all these negative emotions. All of these – grief, anxiety, anger, fear – they can be opposed and subdued by joy. There is perhaps no emotion that we as humans would consider to be positive unless it contains joy. There are so many synonyms to joy and happiness because there is a strong need for us to be able to describe our joy at every level of it – and even so, we often find ourselves unable to describe our joy with words alone. In this verse, the teacher says – a cheerful heart. Not a cheerful face. It would sound weird anyway. Cheerfulness that comes from the heart – genuine cheerfulness. Not a superficial, smiling face – I’m smiling for you to see so that you don’t worry about me – not that I’m against that mentality, I’m very prone to forcing a smile on my face and pretending everything is okay – but it’s not good enough. A happy heart makes the face cheerful, but heartache crushes the spirit [Proverbs 15:13] – A happy face doesn’t make the heart cheerful. It begins from the heart. We’re asked to be genuinely cheerful. 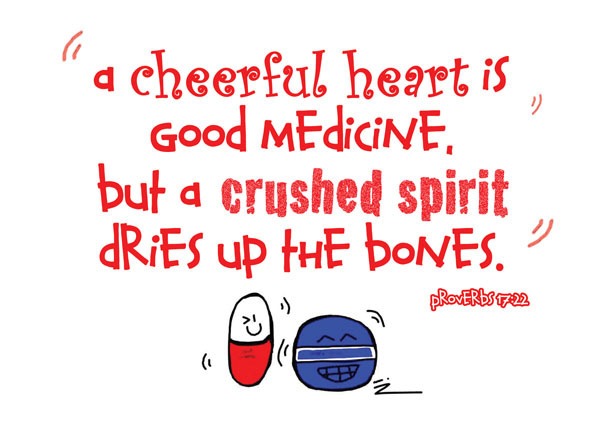 Because true cheerfulness is a remedy to spiritual illness. And while I’m no medical expert, surely it’s better to be cheerful and positive when you’re sick, rather than be miserable about it – even if it’s really a good excuse to be miserable. A sick and miserable person is really hard to live with. In today’s world there are plenty of circumstances that are able to crush our spirits. We learn from them. We mature because of them. Such challenging and difficult circumstances are not going to go away. I always look to Job for an example of a difficult circumstance. He probably is the only example in the entire Bible to so wholesomely represents somebody with a poor physical health and very unhealthy life circumstances; with unhealthy companionship – and yet his spiritual health, though it wavered, it was never crushed. At the end of the day, no matter how bleak our health is, whether spiritual, emotional or physical, we still have hope in the Lord. In Job’s own words at a time of apparent hopelessness – I know that my Redeemer lives, and that in the end he will stand upon the earth [Job 19:25|Article]. In terms of spiritual health – Jesus told us that he came to heal the sick – It is not the healthy who need a doctor, but the sick [Mark 2:17]. How to be joyful, then? How to be positive, then? As much as Proverbs is good in advising us in what to do; it seldom tells us how to achieve it. There’s no button on our bodies that we can simply press and suddenly become happy, unfortunately. I believe very strongly that whether life is good or bad depends not on my circumstances but on my attitude, and while it is difficult to change my attitude – I’ve learnt that it all begins with the little things. Smile, for instance – even if it’s fake or forced at first. Smiling does wonders because it’s contagious. Yes, I’m sick, I have a bad flu and I’m almost bed-ridden – but still I can smile and be happy. I probably look like an idiot smiling with my eyes barely open and my nose red like a clown’s; but sick I may be; God is still good. There is still hope. My spirit is not crushed. Your concluding comments carry a lot of clout: “God is still good. There is still hope. My spirit is not crushed.” Those three statements could become questions: 1) In what ways is God still good to me and those I love? 2) In what do I still have hope? 3) What are the reasons I should not feel crushed in my spirit? The answers could become “pills of positivity”–the good medicine of Proverbs 17:22!